George Gutierrez Jr. | Nagamine Okawa Engineers Inc.
George Gutierrez has been a practicing structural engineer since 2000 and joined Nagamine Okawa Engineers Inc. in 2004. His specialty is in the design of buildings with a high level of Architectural features such as the Westin Ka’anapali Ocean Resort North and Sheraton Waikiki Masterplan Renovation. Other specialties are in the design of commercial structures and military structures including the Army Corps of Engineers Schofield Barracks Quad B Renovation. 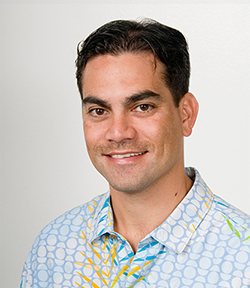 His subspecialties are highway bridge design and educational structures including Structural Investigation and Repairs following the 2006 Kiholo Earthquake and University of Hawaii at Manoa Gartley Hall. He is well respected in the structural engineering community. He is a licensed structural engineer in Hawaii and licensed civil engineer in California. George Gutierrez has his Bachelor of Science degree from Loyola Marymount University and a Master of Science degree from the University of California – Los Angeles.